Well Homeskilleteers...it's that time again! Yes, the heralded brief era of the eating season when a mass snack conglomerate gets together with some kind of sick wizard cabal, locking themselves in a chemical tower doing nothing but ingesting heavy psychotropics with roiling cauldrons filled with strange oozing ingredients all with the idea that they can get a potato chip to sort of taste like meat. We've done it before dear readers and, heck, we are here to do it again! Last year, let's see, what was it that we ate? Gyro? Yeah, I think gyro was one of them. Eh. It was okay. Remember the truffle fries variety? Neither do we. The Reuben sandwich one was...okay. Pretty weird. But if I recall, the biscuits and gravy flavored mixture seemed to appeal to our taste test vict...uh, participants the most. That lot was fairly enjoyable. But why...and how? 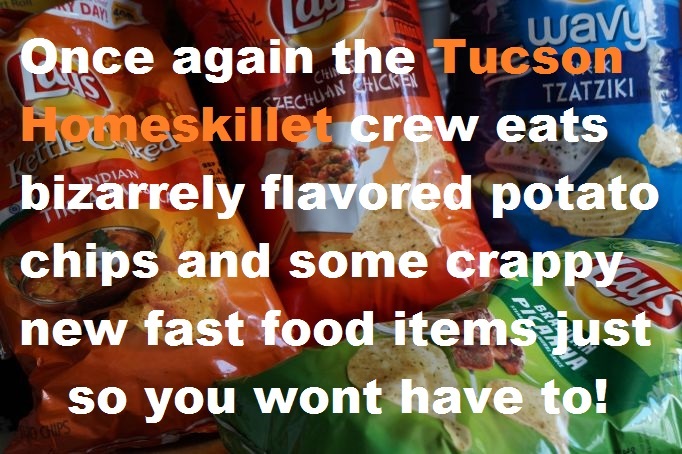 It's an annual right of Tucson Homeskillet passage: They, the royal they, put out a few bags of inspired potato chip ludicrousness around this time of year and we of the brave gasto-fold gather together to eat said aberrant glory all for your well being and entertainment. Or should we say "edu-tainment"? I mean, we are learning you proper on the pitfalls of consuming crunchy whims dashed to the thin and sometimes wavy rafters brought to you by the spite mafia science community who, we all are assuming, are in that high tower of deviant creation laughing at us as we actually purchase and then actually eat potato chips that recreate essences of Asian fare, Brazilian steak skewers and a creamy cucumber dill sauce you pour over Greek sandwiches. Huh. Gyro was last year and now we have tzatziki. You see a pattern here? Is this some kind of Greek conspiracy? Is this...??? Greek conspiracy? Really dude? Well after eating way too much of these new chips I think the assorted alchemical dustings have gotten to your good pal Metal Mark here. I mean, I haven't been able to taste real food in two days. Everything just has this "sheen" to it; a flaccid gulping flavor mire that coated my tongue and brain only to make my breakfast cereal take on the character of a garlicky chimichurri glop. How is this possible, you might be asking me and yourself. 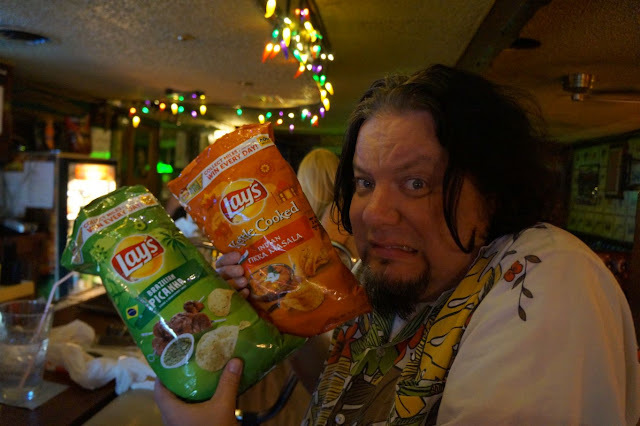 In true and traditional form, we gathered some of the usual food suspects at our favorite hangout to try out the new issues of potato chip madness. Sure. Whatever. Kind of odd but...fine. So were the biscuits and gravy and truffle fries chips of last year. 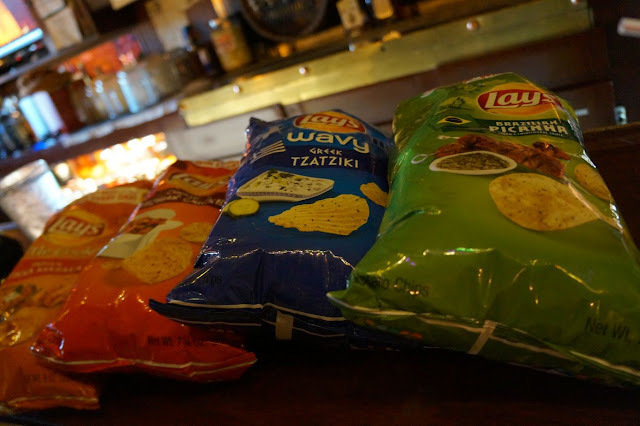 So we splayed out the bags on the bar and then we all dove in, ate, deliberated, consulted, confirmed, burped, groaned, nodded our heads in approval or disgust and now here are the results of the big taste test. First up was the Tikka Masala. 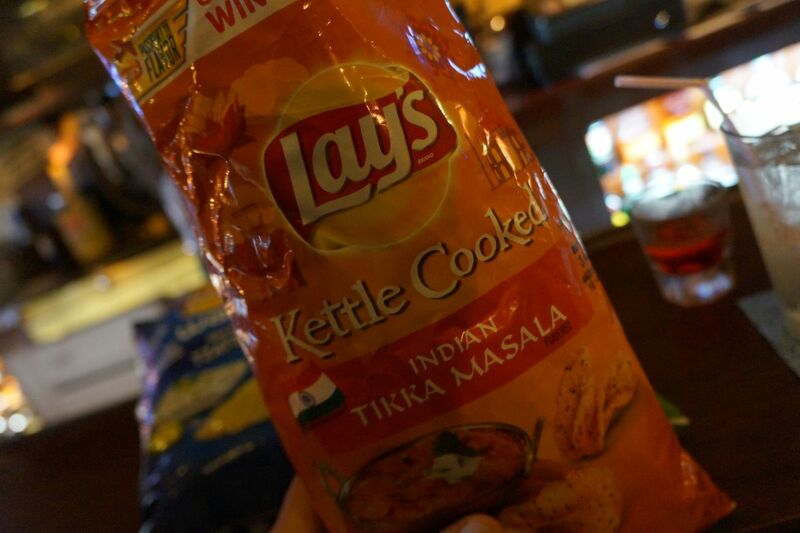 The initial whim on the palate from the Tikka Masala chip was fake tomato sauce. It hits like a spilled bucket of the stuff only condensed into powder form. Then comes the turmeric. Oh boy, the turmeric. Wow. Yeah. It overtook the tomato squirt pretty easily and shifted us into a melange of concocted ingredients. Hints of ginger, some kind of coriander, maybe a whiff of cream even. It took a while to gather up all of the essences, like a few pulls and chews off of the stuff, but once you wrap your taste buds with this chip you can kind of see, sort of, the direction in which they are heading. "I don't like it," one random participant noted. "Tastes like bad marinara, only not good." Um, not too sure what that means but...thanks? "It's interesting," said another. "I can't see myself eating a whole bag but there is something about it that keeps me coming back. I don't normally like Indian food but this is pretty good." As a huge, huge fan of Indian food all I can say is that, yeah, it wasn't bad. No, it's not like the Tikka Masala you get from Sher-E-Punjab or India Oven, but it did have elements of the dish and for that we set this one aside as a "Possibly Maybe" in the winner for the taste race. "Is this what Tikka Masala tastes like? No? Oh, okay. Then I'd have to say I like it enough to not hate it. Does that make sense?" Yeah, eating a whole bag of this stuff would destroy your palate and belly. Plus it was salty. Like really salty. Which is probably what that one guy liked about it. That and he'd been drinking beer since noon. It was after 5pm when we started this. So...there's that. Next up was the Chinese Szechuan Chicken. First bite: Whoa. Spice. Yeah. The chili flavor was pretty pronounced and really did its job. Eating more and more just gave it the extra stoke for the mouth fire. Not that we were suffering or anything, no, it's not that hot (and this is a group that can handle the hot) but it did deliver quite a kick. "I really like this," said my partner in crime She-Ra who adores Chinese food almost as much as I adore Indian cuisine. "It's crazy how it has hints of chicken under the soy and chili flavor." "This is a weird one," stated another brave eater. "It's almost like eating spicy dirt. I don't get chicken anywhere but I do get a feeling that we shouldn't be eating this." "Tastes like pure chemicals," said another. "You know, this is pretty good. I wouldn't buy it, ever, but, yeah...I see where they are going with this." For me I wasn't really a big fan. I totally agreed with the 'spicy dirt' observation. For some reason I also got a distinct chicken flavor but it was over powered by the sizzling tongue punch and the fact that only after eating two different styles of chips my palate was going bye-bye. Chugging water and a cocktail helped but with this kind of witchcraft going on your sinuses began to give way to a swirling cloud of condensed manufactured flavor profiles. I mean, how long did it take to get this idea down to chip size and format? Most importantly...why? If you like snackin' chips and enjoy Szechuan cuisine, you might be excited to try this one out. For me though? It was kind of just too much. On so many levels. 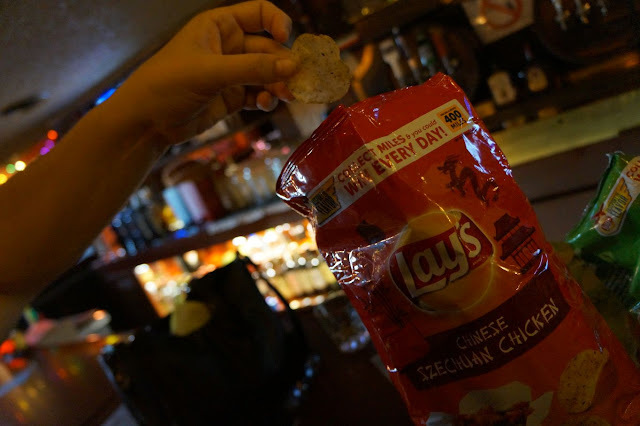 "Holy crap," someone uttered as they bit into this flavored chip. "That tastes just like steak." "Oh wow," followed another. "It totally does." Yep, this is where things got interesting. 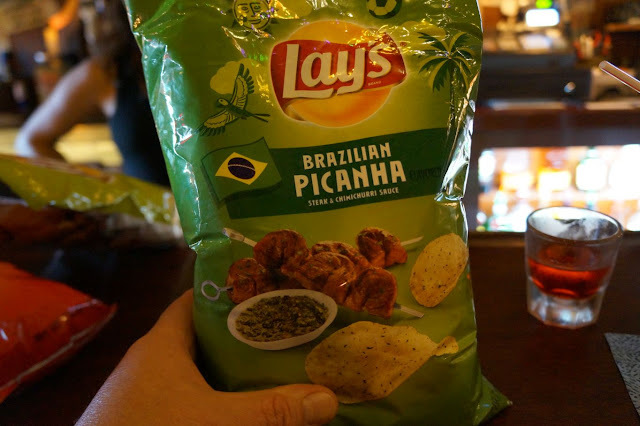 The Picanha chips had a very distinct meat flavor to it and it was a bit off putting for a second. Once the initial shock of grilled rump steak hitting your senses came to pass the after thought of the chimichurri kind of sank in. Kind of. "If chimichurri has garlic in it, then, yeah...I taste garlic." The chimichurri flavor wasn't conquering by any account, quite the opposite, but sparkles of its essence were experienced here and there. Perhaps it was just the parsley flakes that seemed to dabble on the thinly sliced potato product or the fact that several garlic substitutions were used in the makeup of this salty treat. And, yes, there it was again: Salt. These chips are very salty. I mean, sure, most potato chips heavily manufactured like this rely on the salt element to hold the texture and flavor and definitely keep you coming back for more, but this new batch of hellish crunch concoctions have gone to a new level of salty. Along with the fabricated dreamspace of ingredients you might find in a lab result following the embalming of a arachnid sub-demon, these chips fall into a new category of odd, faintly tantalizing and seriously alkaline. So be prepared. Otherwise, I kind of liked the Picanha. Not bad really. Finally we have the true divider of favorites: Greek Tzatziki. The last to hit the rounds was the one that either they loved or absolutely abhorred: The Tzatziki. "Good lord! This tastes like old bathwater, one where grandma was found dead in." "Whoa, this is really yummy. I like the dill." "If a refrigerator that hasn't been cleaned since the Reagan administration had a flavor, this would be it." 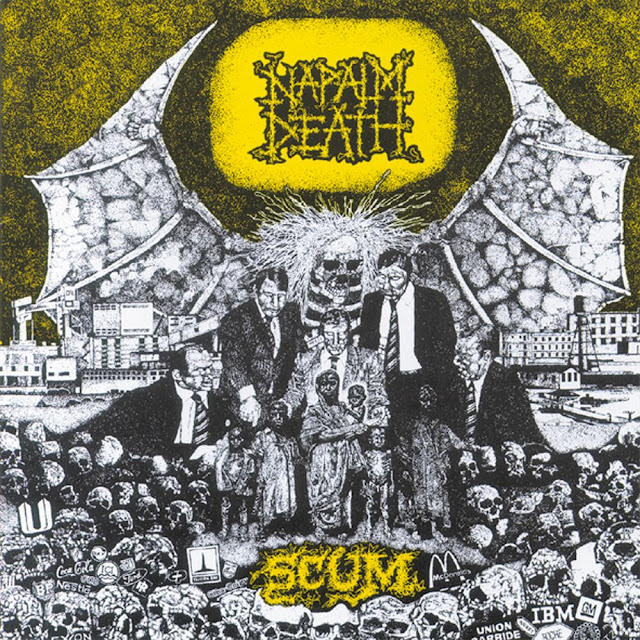 "Not bad. Not great but...the cucumber flavor is nice." "Are you kidding me? Get this the fxxk out of my mouth. Disgusting!" Yep and there you have it. Some loved it while others totally hated it. I was one of them that hated it. Not getting much tzatziki, rather what I experienced was spoiled milk mixed with acrid powdered vegetable substitutes. This one, the last one, was by far my least favorite. The wavy chip style didn't help either. In fact, it just made hate ridges hold on tighter to the sour mash of fake dill and talc reduced cucumber. Imagine biting into a turned yogurt slab that was left in the lawnmower mulch bag for a week and then experienced freezer burn for no apparent reason at all. "You guys are on crack," said Jana who was eating them by the handful with scoops of ranch dressing to ease it down. "This stuff is awesome." She's also very pregnant. We just gave her the bag of tzaziki chips. So, with that, here are the final outcome and results of our taste test! 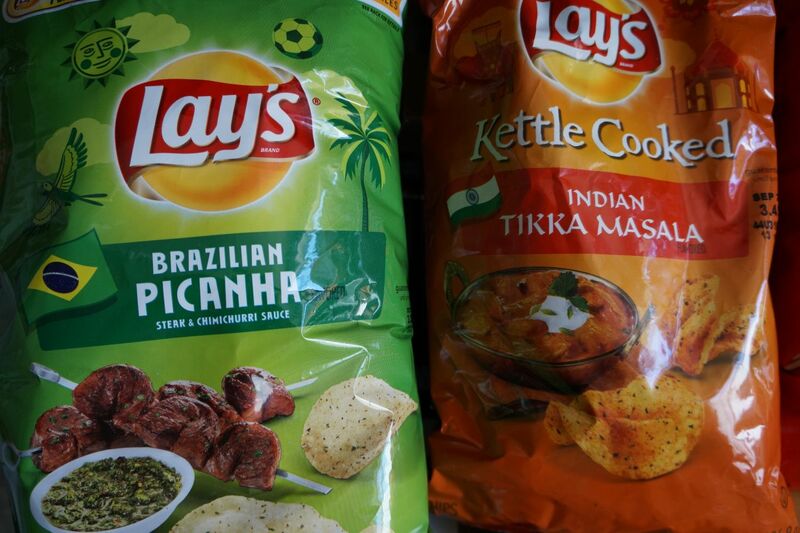 This round of crazy flavored potato chips are most likely created for novelty and not much for absolute enjoyment. I'm sure there are folks out there that think the Chicken Szechuan is the greatest thing since the invention of potato chips and others that are currently brandishing pitchforks and torches and attempting to burn the Lay's factory down to the ground because of such blatant atrocities. But know this gentle Homeskillet reader: We had a lot of fun eating and trying out these various curiosities for the tongue and tummy. They amused, aroused and even started a fight or two, but all in all a good time was had by everyone that participated. 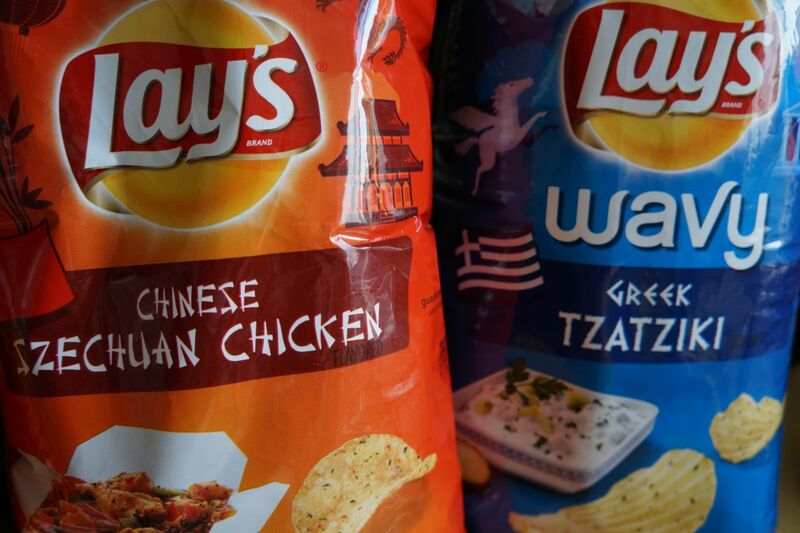 Would we buy these random flavored chips again? Now it's up to you. Try 'em out, or don't, be brave and above all be open minded and keep your palate sharp and tongue relatively protected. Oh, and have a glass of water nearby at all times. Did we mention the saltiness of them all? Yeah we did. Metal Mark's choice....uh...these? I guess? Why you may ask? Because...it's what we do. Plus we were pretty lit from the amount of booze we consumed from trying all of those chips that we ended up in the drive-thru after seeing commercials for these new burger options. So a recent trend in fast food burgers is the "buttery" variety. Down home eateries have been using butter on burgs for quite some time and now it's all over the place it seems. Mind you I have had some darn good butter burgers, some even with the compound and herby stuff jammed right into the meat, so trying this style of fast food was an analytical one. They promise a garlic herb butter on a "gourmet" bun, with bacon and cheese. Since that sounded kind of sad we also added, or at least asked for, lettuce and tomatoes. Well, the late night stoned staff totally forgot the lettuce and tomatoes so what we got was the stripped down style. Yeah it kind of sucked. Really dry with little to no "butter" flavor. Just meat and reconstituted "bacon" with some kind of drippy white cheese. The idea behind a real butter burger is absolute juiciness and decadent mouth feel viscosity. This burger had none of that. Pretty stale, boring and without any of the promise those stupid commercials were promoting. Basically that's why we wanted to try these sandwiches, those freakin' commercials. They make crappy fast food burgers look like a meaty slice of heaven. Getting liquored up and eating bizarre potato chips, which somehow fused our cerebellums making us hapless victims to the horrid advertising industry, subliminally got to us and made us order at the drive thru thinking we were going to get some amazing food fare. Yeah...no. Blame the booze and the potato chips. That's what I did. Next we sampled the Brewhouse Burger. 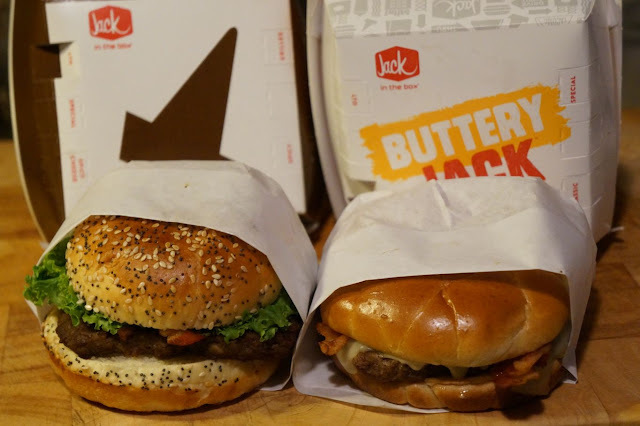 Again, the commercials were not only kind of funny but spotlighted the sandwich in a way that tilted the taste buds and brain into thinking you're getting a hand crafted burger oozing with porter ale cheese, "pub sauce", sauteed onions, more bacon on a "artisan" seeded bun. Sounds kind of awesome right? Much better than the butter burger, this one actually had some flavor and texture to it and, yes, this time they included the lettuce and tomato. Is it the best burger we have ever had? Oh heeeeeeellz no. But for a fast food late night creff burger it wasn't terrible. Would we get it again? Maybe. Depending on how much alcohol is in our system and if you are buying. But good on the fast food chain into trying to step up their game. Perhaps it was the bong hit night crew that screwed it up but, we highly doubt it. Everything in those stores have specific and detailed "spec" sheets and all they have to do is assemble them and then throw them in a bag. Still though, if we were you we'd totally skip that butter burger and give a whirl on the brewhouse option. That is, if you want. 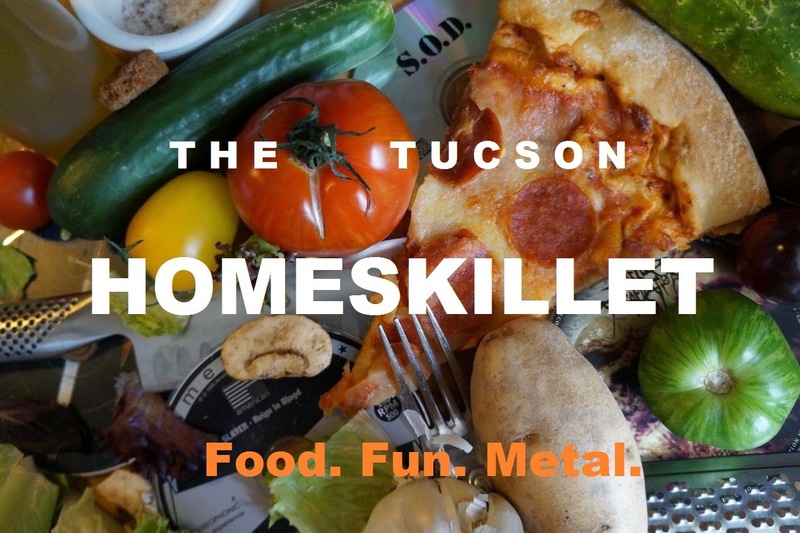 Honestly there are way too many burger joints in Tucson that absolutely slay corporate chains and for that we advise you to visit them and get a real honest handmade chef inspired burger. Please. Thing is, most of those places don't have a drive thru or are open that late. So there's that. Did I mention the drinking and strange potato chip chemicals invading our decision making processes? Yeah. Sorry about that. More power to you... I would not have even TRIED those chips... sounds awful. In my state I guess we do not have those JACK ads because we don't have any Jack (in the box) in these parts. Lucky I guess.